We engineered all of our furniture for easy assembly and installation. After receipt of your order and to insure the installation process is quick and easy with a perfect fit every time, shop drawings will be supplied by Jay’s for your approval at no extra cost. Below are some of the steps we take so every piece of furniture we build will meet your expectations. All of our booths, banquettes, custom lounges, and low walls are preassembled. They have been bolted together and labeled to match a floor plan we provide with every order. 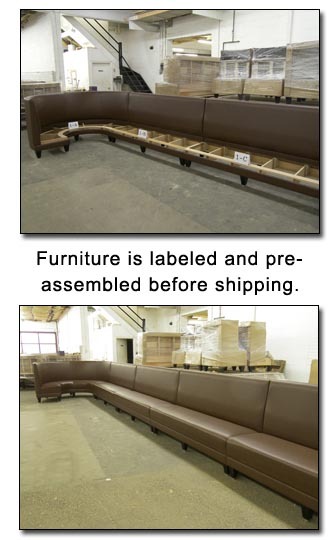 To insure our booths, banquettes and lounge furniture reflect the highest quality expected from Jay’s Furniture Products, extra care is taken during the final assembly process. We fit every part and check for gaps or flaws of any kind. At this time all measurements are double checked to insure a perfect fit for a professional installation. If an assembly or installation question should occur, call our technical support department at 1-800-245-3331 and one of our technicians will help you through the installation process. We're an American seating manufacturer of custom booths / banquettes, pouffes, stools, tabletops, and divider walls for restaurants, casinos, and entertainment companies.